Customize Materials. Maintain Branding. B2B. Faster Time to Market. Use the web to create customized marketing materials – in real-time. Customized materials can be developed at anytime and from anywhere. Use it for B2B or B2C applications. Pharmaceutical sales reps can customize pull-through materials for clients. This use of the system has reduced time to market by weeks. 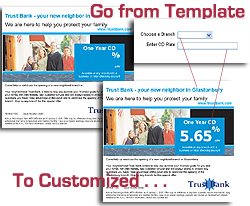 A dental company’s clients can customize and buy their own marketing materials based on templates developed by the company. The majority of these clients don’t have the resources or expertise to create marketing pieces on their own. Both sides benefit from this arrangement. A support organization is using the Digital Store Front to order meeting materials for educational meetings. The items are produced and sent out prior to the meeting. Maintain corporate branding standards and messaging/integrity. Reduce lead times of new (or modified) printed materials, by using templates and standardized branding and messages. Materials are always current working documents. Monitor marketing costs, sales tools effectiveness, and participation. Orders are filled directly by Universal Graphics – no middleman or third party. We print only the quantity you need so there are no obsolete materials to destroy. You receive high quality, full color, printed materials.